Over 600 years ago, visionaries in Italy recorded designs for wind driven vehicles. The first was Guido da Vigevano in 1335. It was a windmill type drive to gears and thus to wheels. 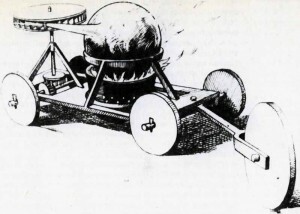 Vaturio designed a similar vehicle which was also never built. Later Leonardo da Vinci designed a clockwork driven tricycle with tiller steering and a differential mechanism between the rear wheels. 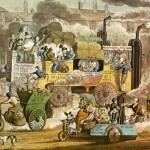 The early steam powered vehicles, which were produced in America and Europe in the late 18th c.�were so heavy that they were only practical on a perfectly flat surface as strong as iron. A road thus made out of iron rails became the norm for the next hundred and twenty five years. The vehicles got bigger and heavier and more powerful and as such they were eventually capable of pulling a train of many cars filled with freight and passengers. As we now see�digital technologies re-invent transportation – even to the point of making commercial space travel a reality,�there is no doubt that the�traditional automobile is also on the edge of reinvention. Engines can’t use gas forever, and so in tribute to the golden age of the automobile this post will present some of the first cars – ever. 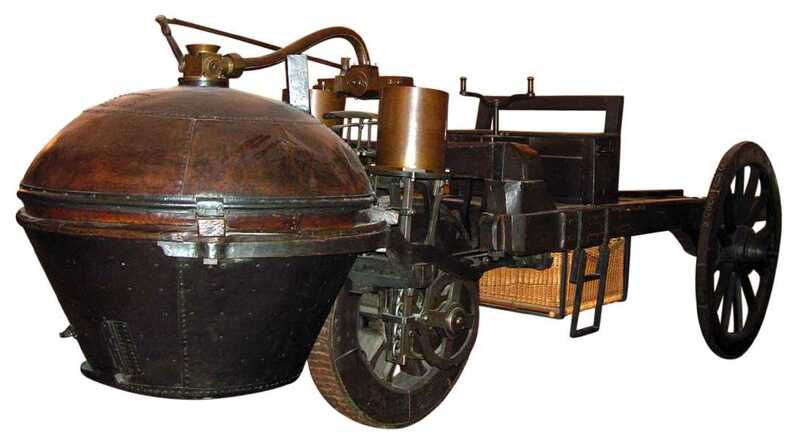 A Catholic priest named Father Ferdinand Verbiest has been said to have built a steam powered vehicle for the Chinese Emperor Chien Lung�around 1678. There is no information about the vehicle, only the event. Since Thomas Newcomen, who designed the first practical engine to use a piston in a cylinder, didn’t actually build his first steam engine until 1712,�it can be�deduced�that the vehicle built by Verbiest was likely a model vehicle powered by a mechanism like Hero’s steam engine, a spinning wheel with jets on the periphery. 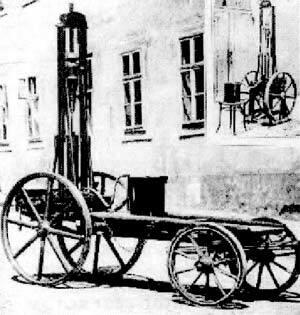 The first vehicle to move under its own power for which there is a record was designed by Nicholas Joseph Cugnot and constructed by M. Brezin in 1769. A replica of this vehicle is on display at the Conservatoire des Arts et Metiers, in Paris.�Cugnot (1725 � 1804) was�a French inventor and military engineer experimented with working models of steam-engine-powered vehicles for the French Army, intended for transporting cannon, starting in 1765 and built a working vehicle that was steam powered, using the steam to turn a piston that turned the wheels in 1769.��The 2.5 ton vehicle moved 4 passengers at a speed of just over 2 miles per hour. 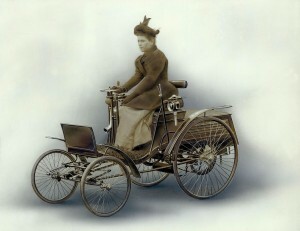 Thought not a vehicle, it was this advancement that made the development of more “user friendly” cars possible. Newcomen’s engine had a cylinder and a piston and was the first of this kind, and it used steam as a condensing agent to form a vacuum and with an overhead walking beam, pull on a rod to lift water. It was an enormous thing and was strictly stationary. The steam was not under pressure, just an open boiler piped to the cylinder. Watt determined the properties of steam and designed a separate condensing chamber for the steam engine. Watt’s first patent, in 1769, covered this device and other improvements on Newcomen’s engine, such as steam-jacketing, oil lubrication, and insulation of the cylinder in order to maintain the high temperatures necessary for maximum efficiency. 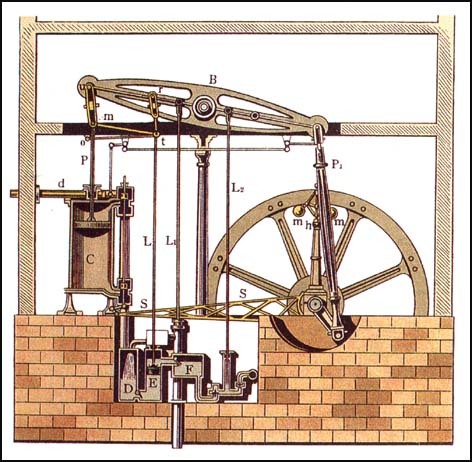 In 1765 James Watt developed the first pressurized steam engine which proved to be much more efficient and compact that the Newcomen engine. And Watt is credited with coining the term �horsepower�. The development of the internal combustion engine had to wait until a fuel was available to combust internally. Gunpowder was tried but didn’t work out. Gunpowder carburetors are still hard to find. The first gas really did use gas. They used coal gas generated by heating coal in a pressure vessel or boiler. 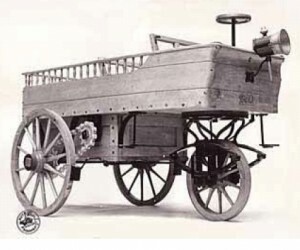 A Frenchman named Etienne Lenoir patented the first practical gas engine in Paris in 1860, a single-cylinder two-stroke engine which burnt a mixture of coal gas and air ignited by a “jumping spark” ignition system,�and drove�his hippomobile�based on the design from Paris to Joinville in 1862. Though he did use some in cars and boats, most applications of the Lenoir engine were as a stationary power plant powering printing presses, water pumps, and machine tools. Other engineers began making improvements in internal combustion technology which soon rendered the Lenoir design obsolete. Lenoir claimed to have run the car on benzene and his drawings show an electric spark ignition. If so, then his vehicle was the first to run on petroleum based fuel, or petrol, or what we call gas, short for gasoline. Less than 500 Lenoir engines of between 6 and 20 hp were built, including some under licence in Germany, and the prolific inventor died poor. Siegfried Marcus, of Mecklenburg, built a can in 1868 and showed one at the Vienna Exhibition of 1873. His later car was called the Strassenwagen had about 3/4 horse power at 500 rpm. It ran on crude wooden wheels with iron rims and stopped by pressing wooden blocks against the iron rims, but it had a clutch, a differential and a magneto ignition. One of the four cars which Marcus built is in the Vienna Technical Museum and can still be driven under its own power. The previous August, Karl Benz had already driven his light, tubular framed tricycle around the Neckar valley, only 60 miles from where Daimler lived and worked. They never met. Frau Berta Benz took Karl’s car one night and made the first long car trip to see her mother, traveling 62 miles from Mannheim to Pforzheim in 1888. 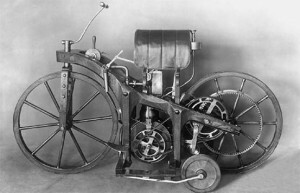 In 1885�Gottllieb Daimler built�a wooden motorcycle. Daimler’s son Paul rode this motorcycle from Cannstatt to Unterturkheim and back on November 10, 1885. Daimler used a hot tube ignition system to get his engine speed up to 1000 rpm. Also in August 1888, William Steinway, owner of Steinway & Sons piano factory, talked to Daimler about US manufacturing right and by September had a deal. By 1891 the Daimler Motor Company, owned by Steinway, was producing petrol engines for tramway cars, carriages, quadricycles, fire engines and boats in a plant in Hartford, CT. In 1871, J. W. Carhart, professor of physics at Wisconsin State University, and the J. I. 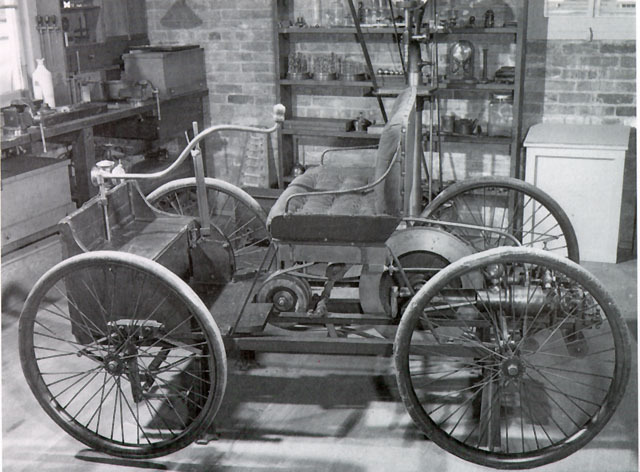 Case Company built a working steam car. It was practical enough to inspire the State of Wisconsin to offer a $10,000 prize to the winner of a 200 mile race in 1878. The 200 mile race had seven entries, or which two showed up for the race. The winning car finished with an average speed of 6 mph. From this time until the end of the century, nearly every community in America had a mad scientist working on a steam car. By 1890 Ransom E. Olds had built his second steam powered car, which was sold to a buyer in India, but lost when the ship it was on was lost at sea. 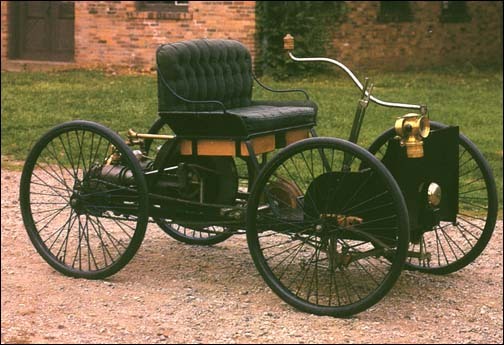 Running by February, 1893 and ready for road trials by September, 1893 the car built by Charles and Frank Duryea, brothers, was the first gasoline powered car in America. 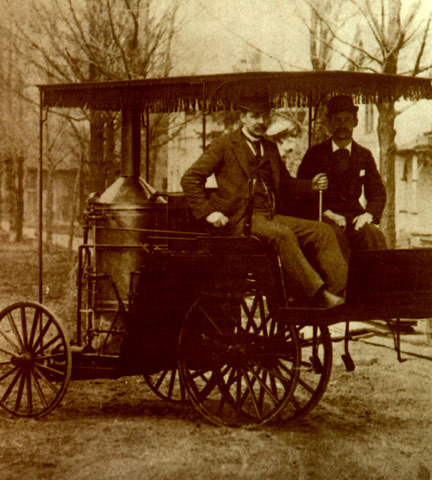 The first run on public roads was made on September 21, 1893 in Springfield, MA. They had purchased a used horse d.rawn buggy for $70 and installed a 4 HP, single cylinder gasoline engine. 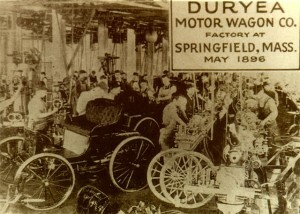 Thirteen Duryeas of the same design were produced in 1896, making it the first production car. n 1898 the brothers went their separate ways and the Duryea Motor Wagon Company was closed. Henry Ford had an engine running by 1893 but it was 1896 before he built his first car. By the end of the year Ford had sold his first car, which he called a Quadracycle, for $200 and used the money to build another one. 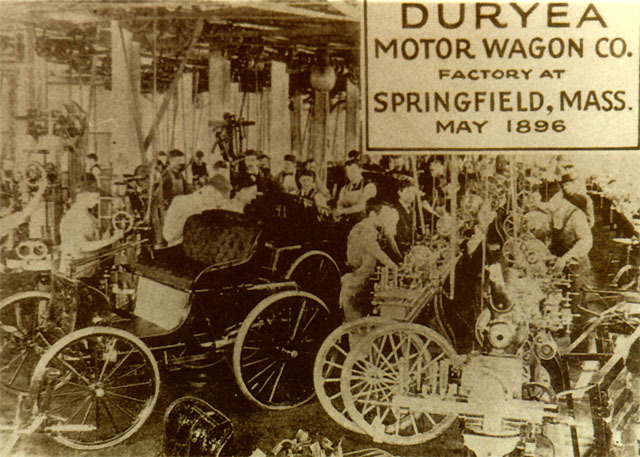 With the financial backing of the Mayor of Detroit, William C. Maybury and other wealthy Detroiters, Ford formed the Detroit Automobile Company in 1899. A few prototypes were built but no production cars were ever made by this company. It was dissolved in January 1901. Ford would not offer a car for sale until 1903. Love it – I would love to have an original Model T, what a collectors item. Then , I would also love to have an original Shelby and Corvette – maybe one day.